David and Dan began sailing 49ers together during the summer of 2010 on San Francisco Bay. It was clear from the start that they had the same passion and drive to perform at the highest level the sport has to offer. Limited financial resources caused them to rely on their strong engineering backgrounds and extensive rigging skills to resurrect an exhausted 49er and create a platform suitable for preliminary training and skill development. One evening after work, they were flying across the Bay in 25-knots and a heavy ebb tide chop when it became clear that their platform was no longer holding rig tension; she was broken on the inside! Unless they took immediate action, this would be her last day of sailing. Returning to the dock at 8 pm, they disassembled the boat. After a quick trip to the market for peanut butter, bananas, and coffee; they began the first of many “all nighters”to bring their boat back to life. Twelve hours of cutting, grinding, laminating, and gluing ensured that they would be back on the water the next day. Following each “all nighter”, both went on to a full day of work, David as a sailmaker, and Dan as a rigger, only to be back on the water each evening for another heavy air training session. Resurrecting the boat consisted of changes as involved as cutting the deck open to rebond bulkheads supporting the rig load, as elegant as creating sheet and control line management systems, as critical as rebuilding spreaders, and as simple as building new halyards This is one of many examples that stand as a testament to a team with perseverance and an unwavering work ethic. 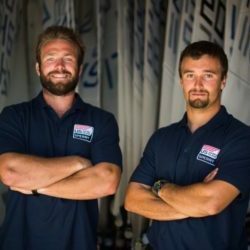 David and Dan followed separate paths during the next 3 years, doing whatever it took to develop their sailing skills. 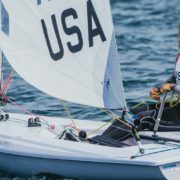 David returned to Tufts to complete his BS in Mechanical Engineering, leading the Tufts sailing team to multiple New England and national titles in Collegiate Sailing. Dan pursued his professional sailing career winning many ocean races, one design regattas, and a Match Racing World Championship. 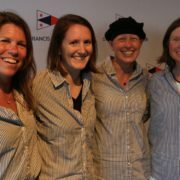 When their schedules allowed, they competed together in high performance boats like 18’ Skiffs and Melges continuing to develop their team dynamic and lines of communication that will be so critical throughout the next six years. David and Dan are officially starting their campaign now, but this campaign was born four years ago on a windy summer day on San Francisco Bay.